BCAA is delighted to introduce a new member of our team: Blue! 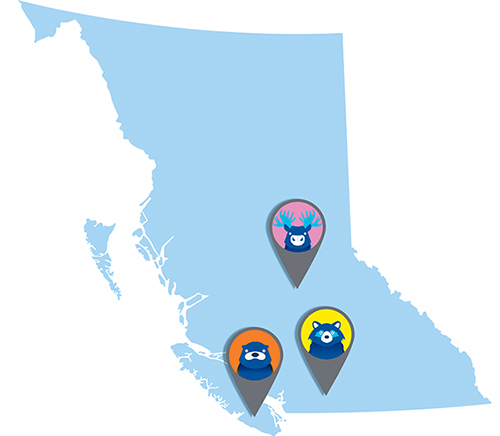 Blue is a very friendly bear who loves to explore British Columbia. And Blue is more than just a bear ... Blue is also a superhero (you can tell by the red cape!). Being a superhero, Blue is always ready to lend a helping paw and has lots of friends who need a little help and who also like to help others. Victoria is an otter who loves to swim and explore in the ocean. Victoria lives in the kelp forests off Vancouver Island with her family. Fernie is a gentle moose who lives in the interior wilderness of British Columbia. Fernie likes to walk on the lake shorelines, eat leafy plants and splash in the water. Stanley is a raccoon who lives in and around the parks of downtown Vancouver. He likes to climb trees and explore the many bushes and trails in the parks at night. He has a large family with five brothers and sisters. Grab your crayons, markers and pens! Join Blue on an exciting journey to learn more about how Blue and friends help each other, and see how you can help them, too.